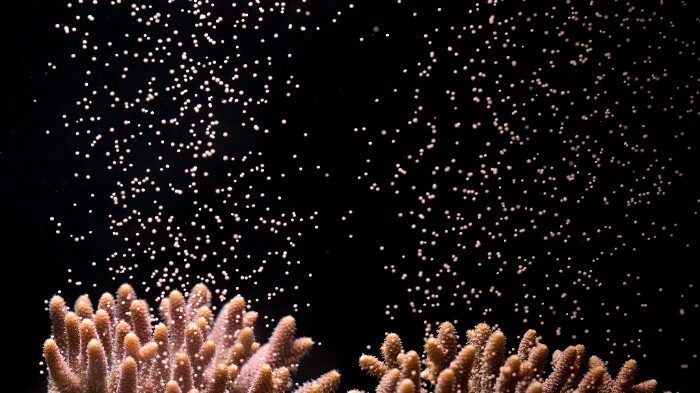 TAMPA, Fla., Tuesday, April 2, 2019- Beginning tomorrow and for the next week, The Florida Aquarium’s biologists and divers, in partnership with the Coral Restoration Foundation and Florida Fish and Wildlife Conservation Commission, the University of Florida, Nova Southeastern University, and others will embark on an unprecedented conservation mission designed to help the Florida Reef Tract combat a rapidly spreading disease that can potentially put this animal at risk of extinction. Over 3,000 unique genotype corals will be introduced to the Florida Reef Tract. These corals were created from eggs and sperm from the corals in Coral Restoration Foundation Coral Tree nursery, and reared at The Florida Aquarium. They will be outplanted into various specific locations as part of an unprecedented conservation mission. 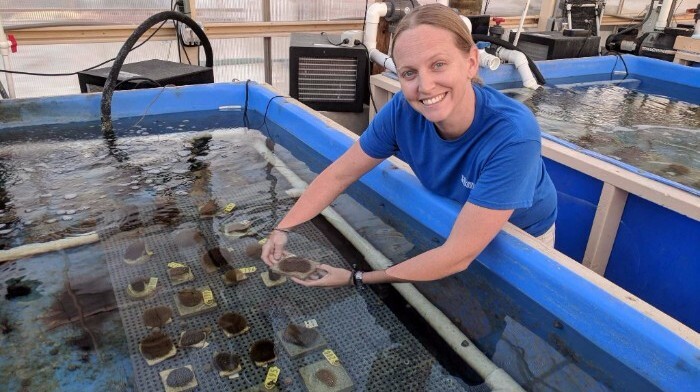 Recognizing these high stakes, The Florida Aquarium will be leading the largest genetically diverse coral outplanting in Florida’s history along the Florida Reef Tract with many entities helping in this critical conservation initiative. The Florida Aquarium is a 501(c)(3) not-for-profit organization whose mission is to entertain, educate and inspire stewardship of the natural environment, and a vision to protect and restore our blue planet. Copyright © 2019. The Florida Aquarium. All rights reserved. Top: A team during one of the first assessment trips to assess the damage of Florida's coral reefs after hurricane damage. 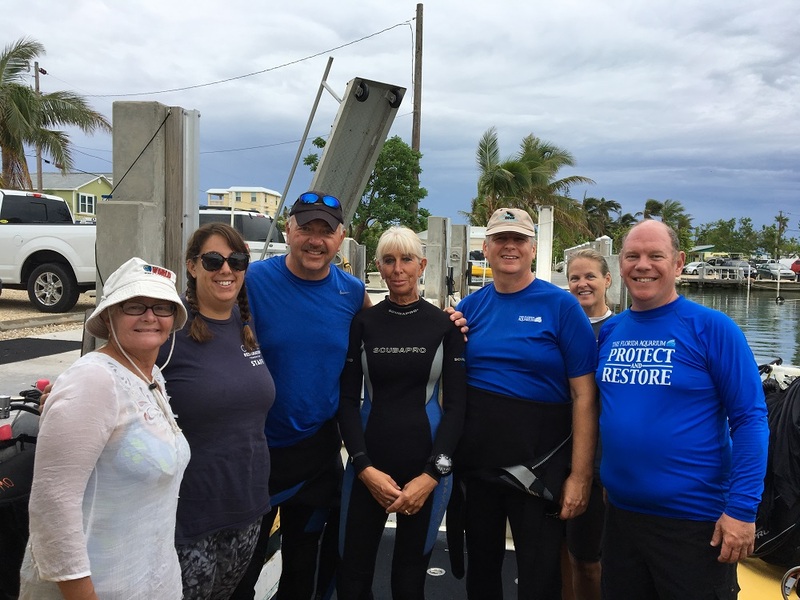 From left to right: Laurie MacLaughlin (NOAA Florida Keys Sanctuary); Jessica Levy (Coral Restoration Foundation); Mark Riss; Deb Riss; Dave Grenda (The Florida Aquarium volunteers); Brenda Altmeier (NOAA Florida Keys Sanctuary); and Dave Rintoul (The Florida Aquarium Dive Safety Officer) Left: The Florida Aquarium's Dave Safety Officer, Dave Rintoul, attaches coral fragments to an existing coral tree in the Coral Restoration Foundation's nursery. These activities were conducted under permit FKNMS-2015-133-A1. Right: Coral Restoration Foundation staff member Jessica Levy surveying health of corals at Sombrero Key. What: After assessing the damage caused by Hurricane Irma on Florida’s coral reefs, The Florida Aquarium is helping the National Oceanic and Atmospheric Administration (NOAA) and other organizations repair the damage and help the reef recover. The Aquarium will be providing triage support including repositioning overturned, centuries old boulder corals; reattaching broken and fragmented pieces of coral; and removing debris. Where: The Florida Aquarium, 701 Channelside Drive, Tampa, Florida. After assessing the damage caused by Hurricane Irma on Florida’s coral reefs, The Florida Aquarium is helping the National Oceanic and Atmospheric Administration (NOAA) and other organizations repair the damage and help the reef recover. The Aquarium will be by providing triage support including repositioning overturned, centuries old boulder corals; reattaching broken and fragmented pieces of coral; and removing debris. Coral reefs cover two percent of the ocean floor but are home to 25 percent of marine life in the ocean. They provide critical habitat for other species such as sea turtles, dolphins and sharks, as well as help protect coastlines from storms. “Healthy coral reefs are adapted to withstand hurricanes. In fact, they protect shorelines by dissipating wave energy, but the reef ecosystem in the Florida Keys has been heavily compromised and is found in small patches compared to what once existed. So when a huge hurricane like Irma hits, damage to corals can be devastating. They now need our help to recover. A healthy, living and thriving reef means a healthy, living and thriving ocean,” said Margo McKnight Senior VP of Conservation, Research and Husbandry at The Florida Aquarium. 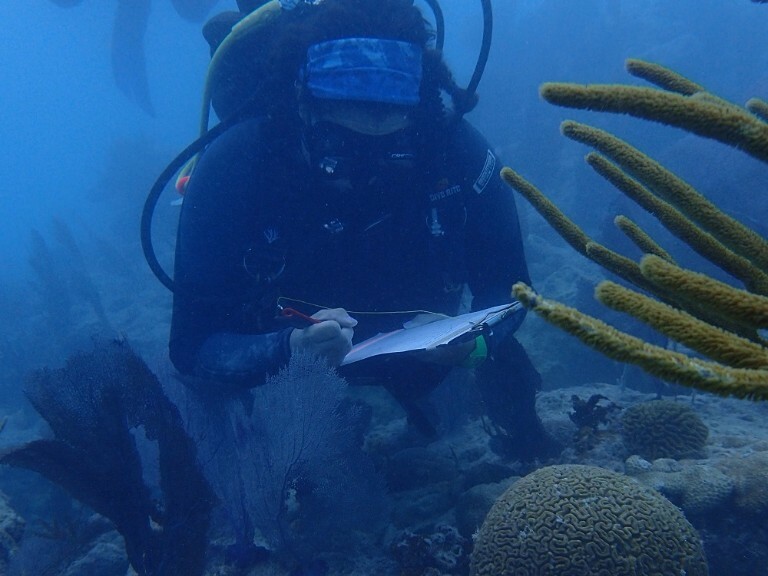 Last month, assessments of the Florida coral reef tract following hurricane Irma showed significant impact on natural coral reefs and manmade ocean-based coral nurseries throughout the Florida Keys and Dry Tortugas, as well as the broader Caribbean. Large hurricanes can cause extensive damage on land, as well as under the sea, especially for corals that cannot leave their home to flee for safety. Initial assessments of more than 50 sites revealed extensive shifting of sand and heavy sediment accumulation on the corals and sponges, which can smother and prevent them from getting enough sunlight, as well as some structural damage to individual corals and the reef itself. A full report is expected later this fall. To help assist in the recovery of corals on the continental United States’ only barrier coral reef, The Florida Aquarium is helping NOAA, federal and state governmental agencies, academic institutions and other nonprofit organizations perform emergency recovery/restoration and assist with the stabilization and recovery of corals that sustained damage following the hurricane. “During the assessment trips, it was very eye-opening to see these hundred-year-old corals snapped in two, with broken pieces sprawled all throughout the ocean floor. The assessment process identified damaged areas of the coral reef tract that could benefit from triage and restoration, so this next trip is to visit some of those sites and help stabilize them,” said Keri O’Neil, Coral Nursery Manager at The Florida Aquarium. The Florida reef tract, much of which lies within the Florida Keys National Marine Sanctuary and Biscayne Bay National Park, contains seven coral species designated as threatened. The Florida Aquarium staff will leave to travel to the Keys to help repair certain coral sites on Sunday, Nov. 12. Dive and repair days are Nov. 13 – 17, and the team will return home on Nov. 18. The Florida Aquarium will send updates with photos and videos during the assessment days, as possible. This massive initiative involves several branches of NOAA, National Park Service, Florida Department of Environmental Protection, Florida Fish and Wildlife Conservation Commission, Nova Southeastern University, Coral Restoration Foundation, The Nature Conservancy-Florida and The Florida Aquarium, with funding provided through a grant from the National Fish and Wildlife Foundation and administered through the Coral Restoration Foundation. Copyright © 2017. The Florida Aquarium. All rights reserved. The No. 2 Week of Sharks Returns! (WASHINGTON, D.C. — June 20, 2017) SharkFest, television’s second-best-known week of sharks, returns to Nat Geo WILD on Sunday, July 23 at 8 PM ET. In addition, decorated Olympian Ryan Lochte makes a splash to help spread the word about the most sharks per square inch on television. Celebrating its fifth anniversary, SharkFest presents factual shark stories incorporating innovative research technology to reveal compelling insight on some of the most unique shark species in the world. With the help of scientists and shark experts, SharkFest will deliver the facts and raise awareness about these “jawsome” animals in more than 131 countries and 38 languages. SharkFest kicks off with a look at the animals that dare to take on sharks. Seals, crocodiles, octopi, bobcats and even birds have gone head to head with these elite killers, and we’ve uncovered the footage to prove it. Watch rare moments when a shark ends up on the receiving end of an attack. It’s time for nature’s ultimate underwater showdown. Every diver has been warned that sharks feed at night, but is this a myth or does the truth lurk somewhere deep beneath the waves? Professional shark diver Eli Martinez and scientist Matthew Smukall plunge into the nighttime world of Tiger Beach to investigate whether shark behavior changes once the sun goes down. National Geographic underwater photographer and Instagram star Brian Skerry is on a mission to change the perception of our oceans’ greatest predators – sharks. After three decades capturing the world’s oceans on camera, Skerry knows sharks as kings of the oceans that keep these fragile ecosystems functioning, not as violent “Jaws”-like man-eaters. Across the vast oceans are underwater oases where sharks congregate in huge numbers. What is the attraction at these mysterious waypoints? Join shark scientist Riley Elliott on a unique expedition as he investigates some of the largest and most mysterious shark gatherings on the planet. The deep blue sea is a majestic place explored by many, but it also holds some of the world’s deadliest apex predators … sharks! These savage killers have one thing in common: the need to feed. In their quest, they use sheer force, technique and genetics to achieve their ultimate goal. For the first time ever, National Geographic is bringing audiences to new depths with shark experiences across the company’s many interactive platforms, including a National Geographic Museum SHARK exhibit, a shark-sighting app in partnership with Atlantic White Shark Conservancy, photojournalist Brian Skerry’s book of shark photos and a shark feature in National Geographic magazine. 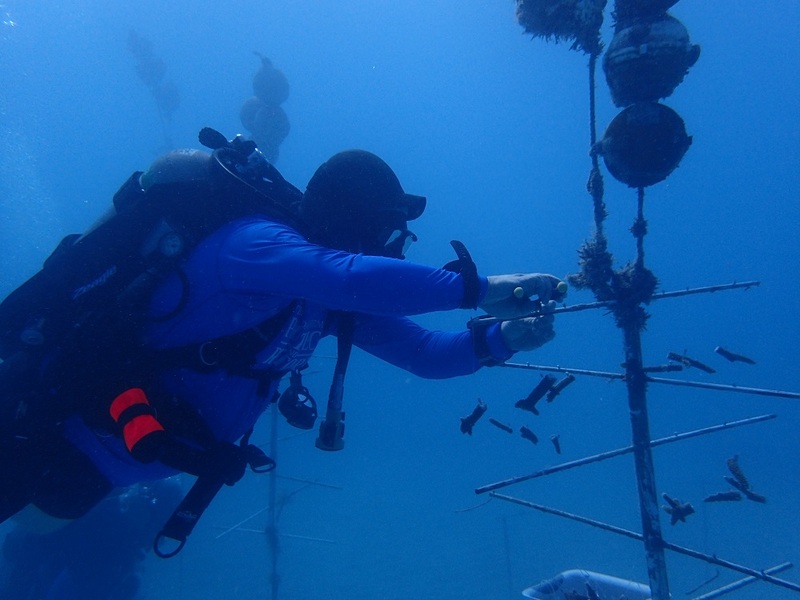 Tampa, Fla. – (April 4, 2017) After months of planning and six days in the field, an international team of 13 scientific divers from The Florida Aquarium and the National Aquarium of Cuba (NAC) has successfully constructed an underwater staghorn coral nursery in Cuba waters. This completes a second step in a long-term plan to protect and restore coral reefs in shared waters. Washington, D.C., September 14, 2016 -- Born Free USA, a global leader in animal welfare and wildlife conservation, commends California governor Jerry Brown for signing S.B. 839 yesterday: a budget bill that includes the California Orca Protection Act. Authored by Assembly member Richard Bloom (D-50), this law bans the possession, capture, export, and breeding of orcas in California, with an exemption for orcas currently held in captivity. Orcas are unsuited to captivity and suffer enormously in marine parks. These remarkably intelligent animals swim 100 miles per day in the wild and have profound relationships with their family pods. In the wild, the average lifespan is 30 years for males and 46 years for females, although they have been known to live 90 years. Captive orcas are susceptible to a range of ailments and issues that cause misery and drastically shorten their lives. Mental anguish takes a severe toll and orcas have been known to self-mutilate out of boredom and desperation. Most die before they reach age 25 in tanks that are only 1/10,000th of one percent the size of their natural home ranges. Born Free USA is a global leader in animal welfare and wildlife conservation. Through litigation, legislation, and public education, the organization leads vital campaigns against animals in entertainment, exotic “pets,” trapping and fur, and the destructive international wildlife trade. Born Free USA brings to North America the message of “compassionate conservation”—the vision of the United Kingdom-based Born Free Foundation, established in 1984 by Bill Travers and Virginia McKenna, stars of the iconic film Born Free, along with their son, Will Travers. Born Free USA’s mission is to end suffering of wild animals in captivity, conserve threatened and endangered species, and encourage compassionate conservation globally. More at www.bornfreeusa.org, www.twitter.com/bornfreeusa, and www.facebook.com/bornfreeusa. Heyday Films, LBO Productions, DreamWorks SKG, Participant Media, Amblin Entertainment, Reliance Entertainment and Touchstone Pictures present a PG-13, 131 minute, Romance, Drama, novel by M.L. Stedman, directed and written for the screen by Derek Cianfrance with a theater release date of September 2, 2016. Chelonian Conservation and Biology – Four decades of research on Hawaiian green turtles (Chelonia mydas) are consolidated in this comprehensive review article, offering new and updated demographic information. The data collected show how the green turtle has rebounded from near extinction in the 1970s to a population of about 4,000 breeding females today. The scope of research conducted during these years is detailed in the journal Chelonian Conservation and Biology. The Hawaiian Institute of Marine Biology and the U.S. Fish and Wildlife Service began studying the green turtle in 1973 by monitoring and tagging nesting turtles. In 1982, a marine turtle research program within the National Oceanic and Atmospheric Administration (NOAA) started studying sea turtle strandings and necropsying dead turtles. A companion program launched in 1990 sought to rescue, rehabilitate, and conduct clinical research on stranded turtles. Early research showed that unregulated commercial hunting of Hawaiian green turtles, primarily for the restaurant trade, was unsustainable. Preliminary data from that period convinced the state of Hawaii to legally ban all commercial taking of turtles. This was followed by adding the green turtle to the U.S. Endangered Species Act. These green turtles primarily inhabit the northwestern Hawaiian Islands that extend from Nihoa to Kure. As remnants of extinct volcanoes, these islands are geologically older than the southeastern Hawaiian Islands, where the eight large islands are home to most of Hawaii’s human population and still-active volcanoes. Seven long-term data sets and associated sample arrays now exist and are catalogued at NOAA’s Pacific Islands Fisheries Science Center in Honolulu, HI. Samples were collected annually over periods of 24 to 41 years. The seven data streams include nesting female monitoring and tagging; ocean capture/basking turtle tagging; strandings; necropsies, including pelagic turtles by catch; rehabilitation and release; euthanasia; and satellite tracking. “I am extremely encouraged and confident that the resiliency and durability of the Hawaiian green turtle population can overcome any reasonable challenges it may face, so long as human take is sustainable,” said George H. Balazs, a researcher with NOAA and lead author of the review. The research on green turtles in the Hawaiian Islands offers a model for understanding recovering sea turtle populations. Conservation and management practices in Hawaii founded on this research serve as a learning tool for other Pacific islands trying to sustain important sea turtle resources. Full text of the article, “A Review of the Demographic Features of Hawaiian Green Turtles (Cheloniamydas),” Chelonian Conservation and Biology, Vol. 14, No. 2, 2015, is now available online. Chelonian Conservation and Biology is a scientific international journal of turtle and tortoise research. Its objective is to share any aspects of research on turtles and tortoises. Of special interest are articles dealing with conservation biology, systematic relationships, chelonian diversity, geographic distribution, natural history, ecology, reproduction, morphology and natural variation, population status, husbandry, community conservation initiatives, and human exploitation or conservation management issues. For more information about this journal, see http://www.chelonian.org/ccb/. Could Drifting Nuclear Radiation from Japan be the Cause of Biological Weirdnesses in the US? Observers in Japan say the disabled Fukushima nuclear power plant is still pumping tons of highly radioactive water into the Pacific Ocean more than 1000 days after being damaged by a 45-foot tsunami on March 11, 2011. US officials insist that no increase in radioactivity from the Japanese disaster has been detected in US monitoring stations. However, environmental scientists are noting an increase of inexplicable biological weirdnesses in marine life along Americas West Coast. According to a recent study published in the journal Proceedings of the National Academy of Sciences, the number of deceased sea creatures on the floor of the Pacific is higher than it has ever been since monitoring of the sea floor began 24 years ago. Currently, the ongoing melting sea star epidemic has been seen off the coast of California, Oregon, Washington and Canada. The disintegrating sea stars have yet to be explained. In February, scientists analyzing kelp off the coast of San Diego discovered the presence of cesium, a radioactive isotope that is linked to the Fukushima Daiichi power plant. In addition, scientists discovered the first ever documented case of conjoined gray whale calves off the West Coast of Mexico. The cause of a drastic plunge in baby California pelicans, from 1,000s to 10 or less, is also unknown. Mutant butterflies have been created by Fukushima radiation, said Japanese scientists. Ocean radiation seems to be killing marine life forms along Americas coast and the potential danger to human health is not being reported by mainstream media, said health educators Carl and Jhoane Robinson. The Robinsons said that as ocean water evaporates into the air and is blown inland, it will rain down on people, animals, and crops in California and the Western US. West Coast produce exposed to radioactive molecules will be shipped to grocery stores across the nation. In such a scenario, the implication for our national health is not encouraging: According to the National Academy of Sciences, any exposure to radioactivity, no matter how slight, increases cancer risk. Sufficient levels of the mineral iodine in the thyroid tissues can prevent the uptake of harmful radioiodine molecules. Restoring low iodine levels to normal typically rejuvenates the entire immune system, especially the bodys ability to isolate and eliminate radioactive contaminants. Carl and Jhoane (Joan) Robinson are health educators and co-founders of liquid dietary supplement manufacturer Cedar Bear Naturales. A clinical & formulary herbalist and nutritional therapist with a Master of Herbology in herbal pharmacognosy and pharmacology, Carl has been an insider to the herbal products industry for 30 years and was involved in passage of State legislation that in turn became the template for the Federal governments Dietary Supplements Health Education Act of 1984 (1984 D.S.H.E.A.). He is also the author of numerous White Papers and published works and educational courses on herbs and natural health. Jhoane is a traditional herbalist, yoga instructor & meditation facilitator and organic gardener and the former lead writer for a nationally distributed herb journal and natural health newsletter. She is the daughter of an MD internist who co-founded the largest medical clinic in the northwest and was inflicted with a disabling auto-immune condition at an early age, which she overcame utilizing natural holistic means.